Softball Weight Training tips, exercises and workouts specific to Softball sport. Build Muscle, strength and stamina with these Exercises and you will never be out of energy. When it comes to Weight Training every sport concentrates on specific body parts and so should you as a softball player. Softball Weight Training should focus specifically on developing those body parts directly involved in softball. But this does not mean you should not have a generalized weight training program. Building a minimum amount of Muscle and strength is a must if you want to have peak performance both on and off season. Sample Softball Weight Training Workouts. 1. Softball Generalized Weight Training to build an overall quality fit physique. Sports Coaches around the world are realizing the importance of their players' having a toned muscular physique. Muscle provides endurance and power so crucial in sports. Every professional now is involved in some form of Weight Training both on and off season. The best exercises are Multi-joint compound Exercises. They act on many major muscles simultaneously, building strength and forcing stabilizing muscles to co-ordinate with the majors thus helping the body function as a unit. Compound moves with free weights should be the basis of all your training programs. Clean and Press, Deadlifts, Chest Press and Squats are the cornerstone of developing a strong body. Check the Sample Weight Training Workouts to get started. Also called Functional Training, it helps to develop specific areas and skills. It develops athletic performance, muscle tone, reflexes, posture, body movements and reduces injuries. Do not confuse this with Abdominal Training. Core conditioning involves the entire Trunk training. This means Crunches, Swiss Ball Exercises, Sit ups, One legged Sit ups have to be combined with Deadlifts, Hyperextension, Good mornings and Leg Exercises. Deadlifts provides great trunk stability so crucial to stay strong and injury free. Developing Sharp Reflexes, coordination and flexibility. Use of Stability Balls and Balancing boards is really helpful in developing quick reflexes, mind-muscle co-ordination and isolated muscle groups. 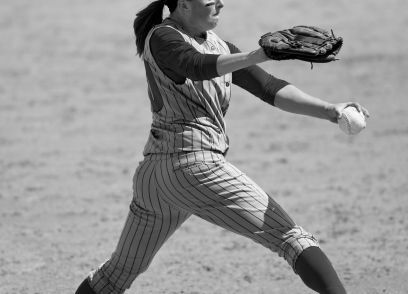 Staying Injury Free is a big challenge for softball players. Stretching, proper training and functional training will go a long way in preventing injuries. Infielders - Concentrate more on Leg Training to prevent knee injuries. Throwing - Risks rotator cuff injuries so should concentrate more on shoulder exercises. Be in constant motion throughout the game. Never stand idle. Have a very good deep stretches and warm ups for every game. Practice running, sprinting and throwing to condition your muscles. 4. Sample Softball Weight Training Workouts. We have already dealt with the standard Weight Training Workouts. Now we will concentrate on the best weight training exercises specific to Softball. Specific workouts consists of 4 different exercises. Concentrate on the basics. No fancy exercises here and obviously no time wasting developing your forearms when you need more of stronger legs and back. Clean and Press, Chest Press, Deadlifts and Squats. Optional exercises are Leg press, Hyperextensions and Good Mornings. Squats, 3 sets of 12, 10 and 8 repetitions. Calf Raises , 3 sets of 12, 10 and 8 repetitions. Chin Ups, 3 sets of 12, 10 and 8 repetitions. Leg Press, 3 sets of 12, 10 and 8 repetitions.